Violinist Lin He (M.M. '00) performed at Carnegie Hall on November 22, 2014, playing a full program of the music of Dinos Constantinides with Margaret O’Connell, mezzo-soprano; Robert DiLutis, clarinet; and Michael Gurt, piano. The performance, sponsored by Distinguished Concert Artsists of New York (DCINY), focused on the complete compositional output of Constantinides, who is a faculty member at Louisiana State University (LSU). Lin He is an associate professor at LSU. He also serves as concertmaster of the Baton Rouge Symphony and as vice-president of the American String Teachers Association’s Louisiana chapter. During the summer, he teaches at the Sewanee Summer Music Festival and the Alfredo De Saint Malo Festival in Panama City, Panama. 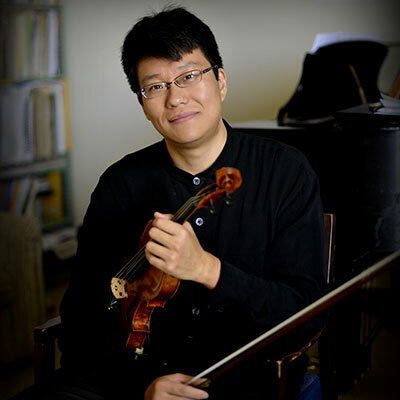 As a soloist and chamber musician, he has performed concertos with the Jiang Su Symphony, the Lake Charles Symphony, and the Tuscarawas Philharmonic. In January 2015, he will appear as soloist with the Louisiana Sinfonietta. During the 2013-14 season, he made his Rapides Symphony Orchestra debut with the Korngold violin concerto, and he also performed at Carnegie Hall for the “Children of Syria” program, sharing the stage with principal players from the Metropolitan Opera, New York Philharmonic, and Philadelphia Orchestra. Lin He has presented recitals at universities across the United States as well as at the East China Normal University, the Nanjing School of the Arts, the Xi’an Conservatory of Music and the Xinghai Conservatory of Music. Most recently, he performed solo recitals and gave masterclasses at Arizona State University, Florida State University, Penn State, Tulane University, and University of North Texas. As an orchestral player, he has performed with the Shanghai Symphony, Rochester Philharmonic, and the New World Symphony. He is also a regular addition to the Louisiana Philharmonic Orchestra. Summer festival appearances have taken him to the Music Academy of the West and the Tanglewood Music Center, where he had a solo performance in Ozawa Hall. He has also participated in the Aspen Music Festival, where he [;aued om the festival orchestra and was the featured violinist for the world premiere concert of American-Chinese composer Huang Ruo. Born in Shanghai, China, Lin He began his musical training at the age of five. He received his doctorate from the Eastman School of Music, where he studied under the tutelage of Zvi Zeitlin. While a student at Penn State, he was a student of James Lyon.